Earlestown is one of the most striking stations on the Liverpool & Manchester Railway (L&MR). Grade-II listed, Pevsner calls it a "delightful little neo-Elizabethan gem". The town heritage trail is, however, a little vague on its origins beyond invoking the activities of a rather aptly named builder, Mr Stone, in the year 1850. I have my own ideas. Cue much conjecture. However, an additional layer of complexity was present at the junction as early as 1831 when a crossover on the L&MR line was added to enable coal from the Haydock collieries to access wharves on the Mersey estuary at Warrington. Finally the station adopted the name of one of the original objectors to the L&MR, Hardman Earle, albeit one who subsequently became a director of the L&MR and of the nearby Viaduct Works, and whose name was given to this area of Newton-le-Willows, Earlestown. The LNWR moved its wagon-building operations to the site that duly evolved into the Viaduct Works. The town grew around the railway with locomotive manufacture initiated by Charles Tayleur in 1832 (this later became the famous Vulcan Works) as well as the manufacture of chemicals and refining of sugar. To save confusion, I will mostly refer to the station as Earlestown. 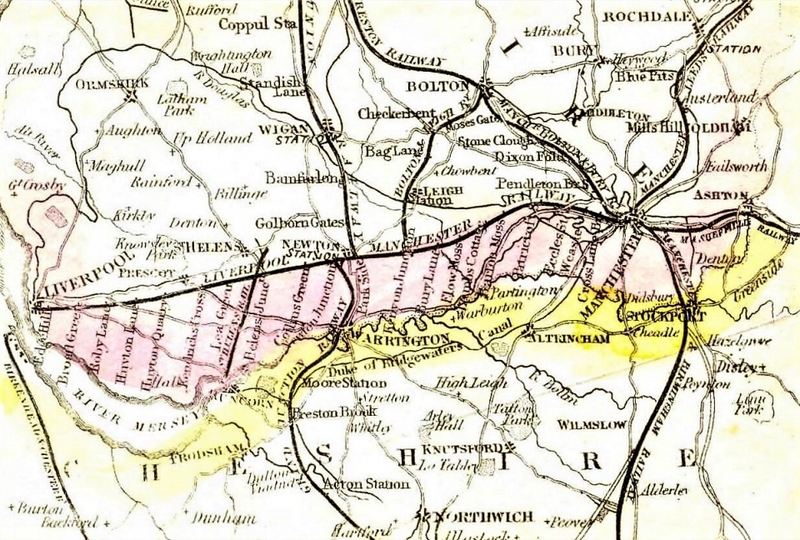 Fig: Map of Lancashire railways in Bradshaw's Guide of 1846 prior to formation of LNWR. Earlestown appears roughly in the centre in the guise of Newton Junction (written vertically) as it was called after merger into the GJR. Fig: Warrington Junction by AF Tait, cropped to show station (full version). Licensed CC-BY-NC-SA 4.0 by Board of Trustees of the Science Museum. As with many stopping-places, there was probably scant provision for passengers in the first instance and no artists recorded the scene for posterity until 1848 in the era of the LNWR. In that year Bradshaw & Blacklock published a series of views of the LNWR by Arthur Fitzwilliam Tait and this included a distant view of the station at Warrington Junction. Born in Liverpool in 1819, Tait taught himself to draw by sketching casts in the Liverpool Royal Institution for an hour before the start of the working day. He later taught sketching and painted views of Manchester that subtly showed the impact of railways on its commercial life. Tait's first railway lithographs were of the Manchester & Leeds Railway published in 1845. After publishing the LNWR set, he emigrated to the United States in 1850 where he established himself as a significant painter of outdoor scenes, often featuring animals. Towards the end of his life he appears to have specialised in painting sheep. He died in 1905. The chief interest is in the early building at the western point of the triangle, presumably the first point at which the L&MR and W&NR met. This is mostly Tudor Gothic in style which is somewhat at odds with the neoclassical buildings of the early L&MR and the widely quoted date of 1835 (Biddle & Nock prefer c.1840). 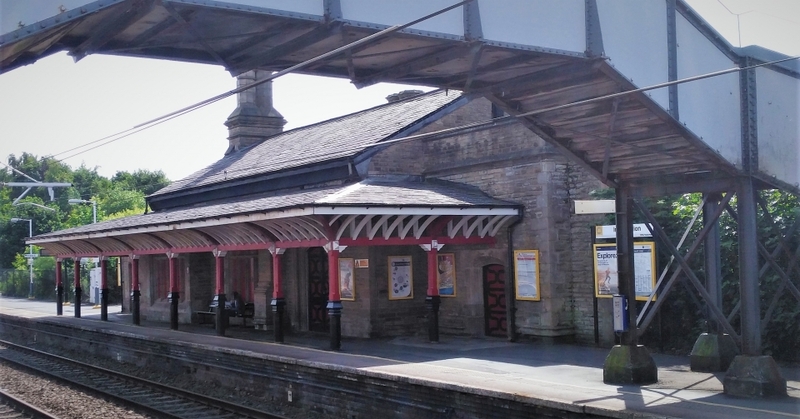 For example, Franklin & Haigh designed the station at Edge Hill (also drawn by Tait) in decidedly neoclassical form with hidden roof and small pediment in 1836, a year later. Either the directors were being unusually eclectic or something else was going on. Not that stations elsewhere were necessarily following the L&MR's lead. Some did and hence the elegant and powerful Euston and Curzon Street termini of the London & Birmingham. The Newcastle & Carlisle Railway, however, saw a trend away from the neoclassical and towards a more homely Tudor Gothic, Hexham and Wylam being examples. My personal resolution of the paradox draws on Tait's lithographs and the suggestion that the building at Earlestown evolved over time in 3-4 phases rather than being constructed de novo in its present form. Fig: The proposed four phases of the station's development. Note that the columns supporting the canopy should be on the platform. The 1839 Newton Tithe Map has the first record of a building on this site. My guess is that the station originally looked similar to that at Newton-le-Willows. Calvert's print of 1835 shows simple buildings either side of the track at Newton and the one to the south may have remained when the main station was built (as shown in Tait's 1848 print). There is a discrepancy here between the date cited by Thomas, 1844, and that on the station plaque, 1848. The former date may reflect an attempt to redress Henry Booth's comment to a parliamentary committee that intermediate stations were inconsequential. The second date may reflect a push by the LNWR post-merger. This new station building at Newton is shown in Tait's lithograph of 1848 with a steeply pitched ridge and valley canopy. By contrast the smaller building to the south follows a simple and familiar cottage style, a rectangular shape with a hipped, pyramidal roof. I previously interpreted the profile of the roof in Calvert's view as comprising a gable pediment but Tait's perspective suggests that it may have been ridge tiles that gave that impression from a distance. Box-shaped structures with hipped roofs are commonly seen in pictures of the early L&MR, for example in Bury's view of the intersection bridge at the top of the Sutton incline. Based on the adjacent locomotive, I would estimate that the building at Newton was of the order of 40 feet long, not dissimilar to the core at Earlestown which is possibly a little longer. The proposal then is that the core of the present building is similar to that seen at Newton though not necessarily at first containing a booking office and waiting-room as there. Many stations evolved from accommodation for gatekeepers and Earlestown, for example, had a large complement of four policemen given the complexity of the track layout and signalling. As we have seen, Earlestown in 1839 was on the timetables of the L&MR and GJR. Newton, however, had from the start been unusual in being a stopping-place for first as well as second class trains and may have merited additional features as a consequence. Earlestown may have acquired its steeply pitched roof at roughly the same time as Newton, where unspecified building modifications took place around 1844, just prior to the merger with the GJR. The roof may also have marked a first step in moving towards the increasingly popular Gothic Revival style. Presumably, however, there were also internal changes for the benefit of passengers as well as effective running of the service. This is the LNWR station as seen in Tait's lithograph with Tudor Gothic coming to the fore albeit as extensions to the core building. Tait's work dates to the post-merger LNWR and it is hard to know without further research whether the GJR or the LNWR brought about the changes or, indeed, whether this phase should be merged with the previous one. 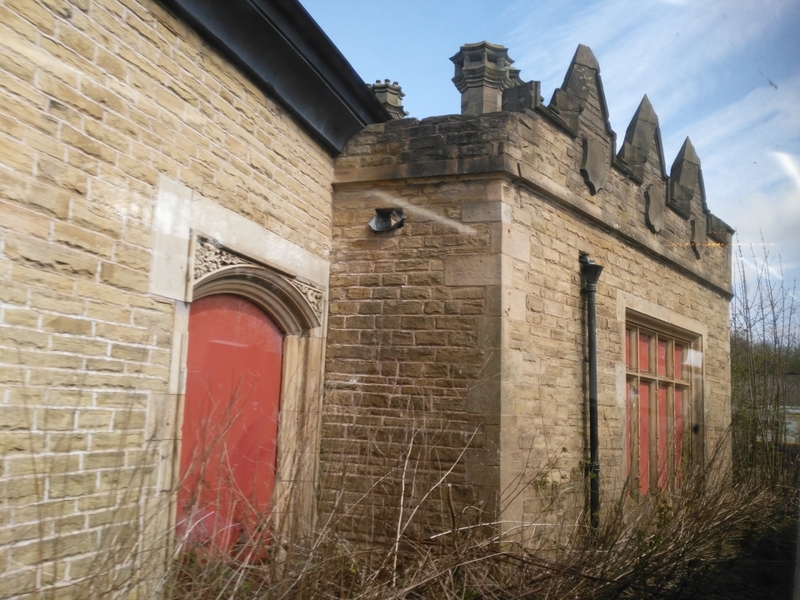 The modifications to the Earlestown building may well have been made by Thomas Stone who became a prominent local builder around 1850 after moving from nearby Winwick. There are few records of early GJR stations. Preston Brook appears not unlike the early L&MR stations, a basic box with hipped roof. The original Birmingham terminus at Vauxhall/Duddeston looks a little like Liverpool Crown Street but with a more prosaic use of lintels for doors and windows. When the terminus moved to Curzon Street in 1837, Joseph Franklin (who had already been involved at Manchester and Edge Hill) designed a neoclassical street facade reminiscent of that constructed by Foster at Liverpool Lime Street in 1836, intriguingly this time featuring paired pilasters. We depend on Tait again for views of Crewe, site of the company's main works. 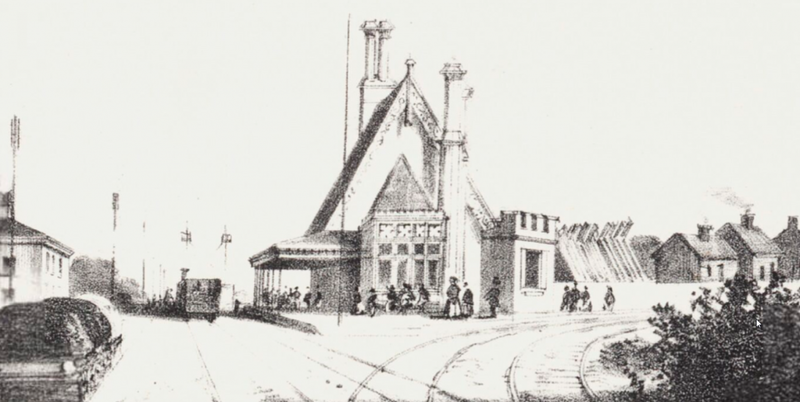 By 1848 the station had an interesting bowed canopy echoed in the simpler canopy of present day Earlestown but apparently absent from Tait's print. Another of Tait's Crewe lithographs shows a rather exotic building with quoins and crenellations as seen on the extensions at Earlestown. The northern side under the canopy may have acquired its seating alcove and neogothic windows at this stage, the original line of the building being marked by the door and recess. The extensions that buttress the western extension are notably absent from Tait's view and only the old L&MR side has an obvious, if low, platform. Wooden sleepers now appear on the curve albeit indistinctly. As with their stone counterparts, they may have been buried. The Warrington platform on the curve (3 nowadays) appears to be fenced off with the area behind used to store a stack of spars or similar (from the Viaduct trestle?). A small cluster of cottages has developed beyond and there is a building, possibly the early Railway Hotel, adjacent to the present platform 1. The mullioned windows appear to be absent from the crenellated extension on platform 3, possibly preceded by muntin-based windows. There is, however, a hint of shutters suggesting that this window doubled as a service hatch during warm weather, selling either tickets, food or reading material. While streetsellers sold newssheets earlier, WH Smith's signed an exclusive deal with the LNWR in 1848 to supply newspapers and books. As expected, there is much evidence of the signalling required for this complex junction but quite how passengers crossed the tracks with a modicum of safety is unclear. In 1903, according to Biddle, the roof was replaced with one that was less steeply pitched, the chimneys being adjusted accordingly. The present bowed canopy was also added at some stage, perhaps so that pillars could be moved out of the way of coaches and engines, and presumably platforms were built to their current height. The crenellations on the southern extension also become more angular with small shields beneath. The window below acquires mullions. 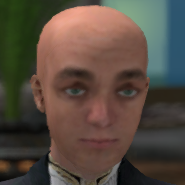 There are a few obvious discrepancies that suggest building modifications. The late addition to the side of the western door has different quoins and a moulding at the base. A similar moulding is seen on the buttress forming the western end of the alcove on platform 2 so this may also have been a later addition. The projecting window to the north has different bricks above it, possibly added when the roof was lowered. Analysis of the work more generally would, however, require an expert eye and it is possible that part of the current exterior is a later dressing on an underlying brick structure. The builds are very sketchy and incomplete at present; basically there is a need for further research and more precise measurements. It would, of course, be useful to see inside and, better still, to see photographs of the interior when it was a functioning station if such exist. At the moment only guesses can be made based on the distribution of doors, windows and chimneys relative to the requirements of staff and passengers. Biddle says that it comprises a single room with exposed wooden beams and superior stone fireplace but surely there is more than one? Clearly this has been a very superficial review of what is known or can be deduced about the building by looking at a very limited number of sources and by comparison with other sites. The main conclusion personally, however, is the counter-intuitive recognition that the "old-looking bits" may not, in fact, be the oldest bits. This may be a commonplace observation but I have not seen it in the standard texts. 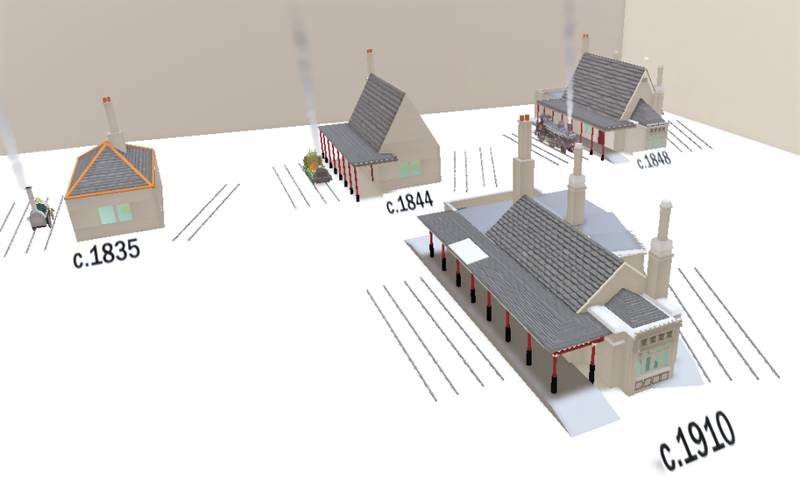 The hypothesis enshrined in the OpenSim build sheds no further light on the claim that 1835 Earlestown is the oldest station building (if only the canopy) still in use on a modern railway system. To my mind, however, it makes the assertion more credible. In any case, compared to "competitors" Earlestown has a much richer narrative in terms of the railway system that it fostered both as junction and as manufactory, and deserves consideration in that regard if no other. Good work has been done with refurbishment at Newton and it would be wonderful to see the Earlestown building brought back to more productive use.